A typical hillside of pulverized granite, the most common soil type found in our canyon. It's been subjected to extreme heat and compression, and it's hundreds of millions of years old. A topography model exhibited at the Franklin Canyon Park museum showing Laurel Canyon. Geology, topography and climate have established both the opportunities and the limitations for development in our neighborhood. Understanding these forces makes each of us better custodians of the land. We live on top of a giant fold in the earth. It's rather like the dirt pushed in front of a bulldozer, which is a mixture of everything that has been scraped ahead and dug up from below. The geologist term for the fold is a transverse mountain range and the mix of soil types, which include oceanic sediments, volcanic debris and compressed rock from deep in the earth, is called an accretion. This soil is from 12 million to 200 million years old. The east-west fold that comprises the Santa Monica Mountain range is unique and one of just two caused by the shearing of the North American and Pacific plates as they move in opposite directions. The range begins out in the ocean and includes the Channel Islands and ends near downtown, past Griffith Park. Some of the rock under our homes is thought to have migrated from islands that were once at the equator, so you can tell your friends that you have an investment in tropical property. For more on the geology of the Santa Monica Mountains, please visit: http://members.aol.com/OnDaNose/Geology2/SMMGeo.html. A practical consequence for homeowners is an understandable concern for the stability of the land. For this, there are no simple answers. Generally speaking, we are safer than people who live in the flats where their homes sit on soft, sandy soils that have been deposited by erosion. 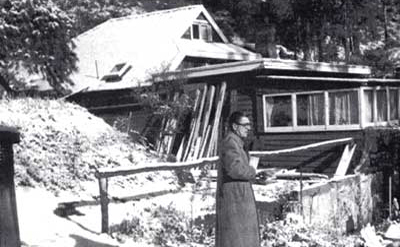 As we saw in the Northridge earthquake, homes in the Valley and in Santa Monica suffered far greater damage than those in the hills where the soil is more compact. But we have other problems, like landslides, topsoil erosion and the problems associated with building on steep slopes. We also reside very close to a number of faults. The fault under Beverly Hills produced a mild tremor two days before the 9/11 attacks. This is why a soils report is so important before new construction is considered. Even if your home was built years ago and has no problems, you will want to consult a soils engineer prior to any significant additions, because soil science has come a long way. Oddly enough, all this concern for stabilization of the hills is also responsible for some of its destruction. The Grading Department is demanding stronger and larger retaining walls prior to construction, which has the effect of eliminating the beautiful hillsides that attract homeowners in the first place. The climate of our hillside community is almost as complicated as the geology. It's the result of several opposing climatic situations. On the one hand, we are on the south side of the transverse mountain range, which means we enjoy the cooling effect of the sea and its moisture laden marine air. This explains the difference in daily temperatures between the Valley and the LA basin, the Valley being much hotter. On the other hand, the southern flank of the mountains receives more sunlight. The drying effect is therefore greater in on our side than on the steeper northern side. Further complicating the picture is the fact that moist air generally moves from the southeast. As it pushes up against the mountains and rises, it loses its ability to hold the moisture and causes rain, which is generally greater on our side. This is why the slopes are more eroded and the streambeds longer than on the northern side. The plants that have evolved to deal with this cycle of drying and wetting have produced the chaparral we see on virgin hillsides, while the bottoms of the canyon valleys produce a wooded, riparian habitat. In the midsummer the average high temperature is 84 and the low is 64. The climate of Southern California is a product of cold ocean water and latitude. It combines maritime and Mediterranean climates. The maritime climate usually prevails within the basin causing a consistent temperature inversion layer. This causes fog, haze and smog. All of which are common within the basin. During the summer a high pressure zone generally prevents precipitation. Winter in California is characterized by rain and is the primary growing season. Spring is known for its fogs, summer for its haze and smog. In the autumn Santa Ana winds occur, blowing from the Mojave Desert to the ocean. Maritime moisture is pushed out to sea and vegetation becomes particularly dry. This is the height of the fire season, which is so closelyassociated with the dry fuel supplied by the chaparral. For more on the climate of Southern California, please visit http://www.laep.org/target/fragile_habitats/climate.html. Yes, occassionally it does snow in Laurel Canyon. This picture was taken in the early 40's. LCA archives.